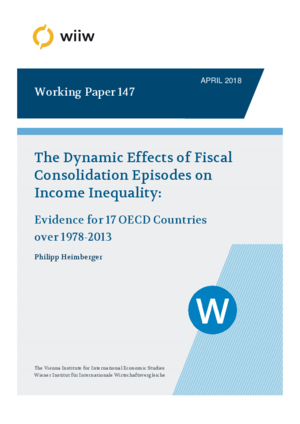 Using an annual data set covering 17 OECD countries over the time period 1978-2013, this paper analyses the dynamic effects of ﬁscal consolidation episodes on income inequality in the short and medium run. By estimating impulse response functions from local projections, we ﬁnd that ﬁscal consolidations typically lead to an increase in income inequality. Baseline results suggest that in the aftermath of the start of a ﬁscal adjustment episode, the Gini coefficient of disposable income increases by about 0.4 percentage points in the short run (in year three), and by 0.6 percentage points in the medium run (in year seven). The impact of ﬁscal austerity measures on the income distribution is found to be more pronounced a) when the size of the ﬁscal consolidation package is large rather than small; b) when the duration of the adjustment is long instead of short; c) when the ﬁscal consolidation is based more on spending cuts than on tax increases; d) when the consolidation is started in the aftermath of a ﬁnancial crisis rather than in a non-crisis episode; and e) when the adjustment falls into a period of low economic growth instead of high growth.